Bivalves commonly known as freshwater mussels can be found in some tropical waters. Although they differ as regards their anatomy, they are in fact distant cousins of the mussels on our coasts. They live buried, or partially buried, in the sediment. They eat by filtering micro-algae or vegetal plankton dissolved in the water. This can be a useful attribute in an aquarium, as it helps contain the proliferation of this type of algae. On the other hand, if there is not enough food, they will eventually die - which is not always noticeable at first, and therefore entails a risk of pollution from their dead bodies lingering in the water. Bivalves therefore have a somewhat limited appeal to fishkeepers, especially as few tropical species are available in the aquarium trade. 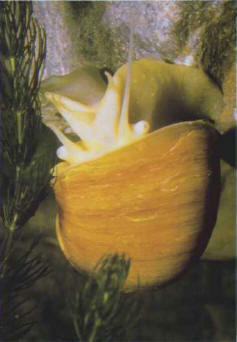 Ampullaria sp., like this golden variety, are one of the most effective gastropods against algae. As regards the gastropods, some species are considered pests - physas, for instance - while others, such as the Planorbidae, Ampullaria, and Malaysian snails, play a positive ecological role, above all by feeding on unwanted algae. In good conditions, they proliferate rapidly; they can be removed by hand or by trapping them with a leaf of lettuce or boiled spinach: if you put one of these in a tank at night, the next morning it will be covered in snails. If a population of gastropods disappears from an aquarium, this is probably a sign of imbalance. ЯКУПОВ Харис Абдрахманович (р . 1919), российский живописец, народный художник СССР. Исторические и жанровые картины, портреты, пейзажи ("Пролог", 1970; "Челнинские красавицы", 1975). Государственная премия СССР (1951).